For the European Championships some ice dancers decided to change their costumes for the short dance. Let’s take a look. Ekaterina’s new dress is definitely way better than her previous one. But honestly, anything would have been better than that dress made of curtain! This dress is more suitable for the waltz, blue also look better on her and on the ice. But I still think that it isn’t the best choice for their music. I also see a mismatch between their costumes. Dmitri’s costume has references to a historical costume while her dress is pretty modern. So, there isn’t a connection between the costumes and characters of the dance. Here we can see another wise change of costume. Last season Penny skated a pasodoble without skirt, at the beginning of this season tried to skate a waltz without skirt. I’m glad that she came to her senses! This tender dress suits her better, fits to the mood of the waltz and also a more appropriate choice for “My tender gentle beast”. And the back is so lovely! It was quite unexpected change of costumes! I wasn’t a fan of Anna’s previous dress but Luca’s costume was very good. And previous costumes fitted to the program and characters. This ones are not so in the mood of the program. More universal. Luca wears a simpler costume, Anna looks like a bride and not like a widow) But generally the dress is just gorgeous! Exquisite beauty! I really like the black accessories, look chic. Elegant, classic, sophisticated dress. Can’t wait to see ot in motion. 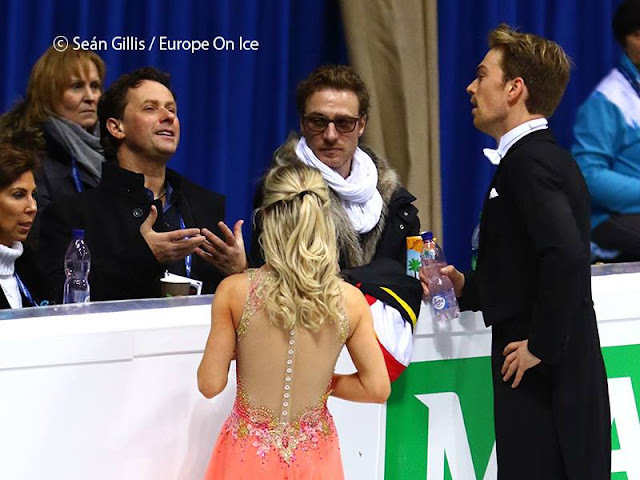 See who was the most fashionable at Grand-prix final in the short dance.